TuFace Idibia is unarguably one of Africa’s finest, he seems to deliver any day anytime. You can wake TuFace from sleep and he still won’t dull on a performance. In fact, looking for a music fan who doesn’t like TuFace is like looking for a needle in a hay stack. 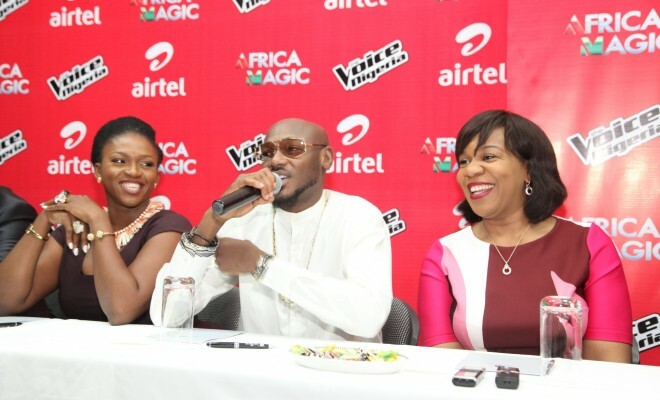 It all happened on Airtel’s The Voice show where TuFace performed and at the end of the song wowed everyone with the lines “Can I please Kiss you Waje”; of cause everyone was so surprised. Waje, is a fellow coach with Tuface Idibia alongside Timi Dakolo and Patoranking. Waje, who was visibly taken unawares by the big question, was speechless.